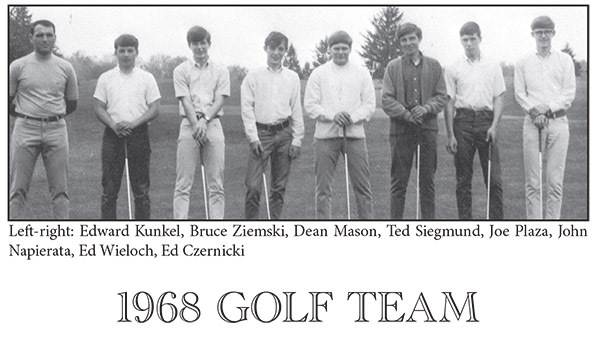 The 1968 Bartlett High School golf team is part of an elite group of teams that have represented Bartlett in tournament play and have also been a state finalist. Seven golfers and one coach faced a challenge that was unique, one that will live on forever and never be duplicated. The team was coached by Ed Kunkel, comprised of Ed Wieloch, John Napierata, Ted Siegmund, Joe Plaza, Dean Mason, Ed Czernicki and led by Bruce Ziemski (team Captain and most valuable player). They finished their season undefeated with a record of 12 wins and 1 tie. In their first eight matches of the season, Bartlett outscored their opponents 68 points to 5 points. They defeated powerhouses Westborough and Southbridge during the regular season, and won four matches in a one-week span. At one point, they were ranked fifth in the state. At the end of the season, to be qualify for the state tournament field of ten teams, Bartlett had to win a qualifying match against perennial powerhouse Duxbury High School. Keeping the amazing feats coming, they won the match by a score of 336 to 338, a total team victory in that each player's score counted towards their victory. The state tournament was played at Putterham Meadows Golf Club in Brookline, home course to several of the participating teams in the tournament. Scoring for the tournament was based on the total of the individual scores of the top five players from each team. The Bartlett Team surprised everyone but themselves by placing second in the field. Only Newton High School scored better, 328 to 336. What makes this team's achievement so great is, unlike other sports competing in a state tournament, school enrollment was irrelevant for golf. There were no divisions separating the larger and smaller schools, meaning large and small schools competed against each other. This tournament field included the teams of Needham, Marlborough, Springfield Cathedral, Saint John's Prep of Danvers, and other Division I schools. No other team in Bartlett's history has been faced with such a unique challenge. The 1968 Golf Team from Bartlett High School had an unbelievable season and played with class and a tremendous amount of determination. In doing so, they brought pride to their school and the Town of Webster.